Employee engagement and retention programs improve Clariant’s internal and external reputation as an attractive employer, increasing interest of potential candidates. These programs reduce employee turnover, mitigate early-leaver risks, lower cost per hire, and hence support Clariant's overall cost-saving targets. Knowing that real performance excellence comes from challenged, empowered, and rewarded teams, Clariant continuously strives to increase its engagement levels worldwide. Its strategies for employee engagement include focusing on strong and authentic leadership, recognition programs, career opportunities, and personal development. Employee engagement is a responsibility of each leader in the organization, as the strongest drivers of engagement are trust in the leadership team, a motivating work environment and atmosphere, and a vision that employees can identify with. Clariant’s Human Resources Department supports line managers to provide transparency regarding career options and development opportunities. In 2018, Clariant updated its Employment Policy, which establishes key principles and minimum standards for working conditions and labor practices. These are crucial to ensure a fair, transparent, and discrimination-free work environment. The policy is globally applicable and must also be applied by employment agencies and contractors doing business with Clariant. The framework underscores Clariant’s commitment to its six corporate values: Drive for Excellence, Disciplined Performance Management, Deliver to Promise, Courageous and Decisive Leadership, Lived Appreciation, and Corporate Responsibility. Clariant has a comprehensive recognition program in place that enhances employee engagement through appreciation and fosters Clariant’s feedback culture. The program includes monetary recognition awards for outstanding achievements and non-financial awards that encourage employees to recognize efforts and contributions of their peers and supervisors in the form of vouchers or presents. The new Global Benefits Policy contains key elements to be covered within local benefit programs, including benefits related to retirement, flexible work arrangements, death, travel, accident, health, and well-being. The policy was developed based on the input received through the global benefit survey conducted in 2018. It does not stipulate a one-size-fits-all program, but acknowledges country-specific circumstances. Based on the materiality assessment conducted in 2017, Clariant reviewed its management approach for the material topic Employee Engagement and identified improvement opportunities, such as a more systematic involvement of Business and Service Units in engagement activities. To evaluate employee engagement, Clariant conducted a »Pulse Survey« among a group randomly selected from the global workforce in 2018. Compared to former engagement surveys, the new format covers more strategic and Clariant-specific topics, such as strategy, vision, and change, and asks for concrete reasons why people want to work for Clariant. The survey results are used for organizational development and help Clariant position itself as an employer of choice. Through targeted action-planning, Clariant improves employee engagement over time. In future »Pulse Surveys,« Clariant will involve the different Business and Service Units more systematically in order to ensure that the specifics of each Unit are sufficiently considered. A global »Pulse Survey« will be conducted biennially. Apart from the survey, Clariant tracks employee turnover and compares it to industry benchmarks to detect decreases in employee retention. Clariant pays wages and salaries that are determined by local relevant competitive market data rather than by legally defined minimum wages. (However, minimum wage standards are always adhered to.) Therefore, Clariant does not keep statistics of the salaries in relationship to minimum wages. A new methodology for calculating this number was introduced in 2018. At the end of 2018, 57% of all senior managers (Executive Committee and top four management levels) were citizens of or had an indefinite right to reside in the country where they were employed. Within the European Union, nationalities of all member states are considered »local«. Clariant's benefit programs are offered according to local market practices and cover common elements, such as retirement, travel, flexible work, accident, death, health care and well-being, among others. No intentional differentiation is made in the company benefits provided by Clariant according to the type of employment contract, but this does not exclude differences depending on the individual case and local circumstances. The deciding criterion in this case is the customary market standard. In 2012, Clariant initiated a program to promote more family-friendly job opportunities. As part of this program, all mothers are guaranteed a comparable position upon their return to work for up to one year following the birth or adoption of a child. For the two years following the birth or adoption, Clariant grants mothers ten days of paid leave for family purposes, in addition to their standard annual vacation. Correspondingly, this provision is available to fathers as well. Considering that all permanent employees of Clariant are theoretically entitled to this provision, this would extend to all 13 613 males and 3 769 females for 2018. In 2018, 268 mothers and 464 fathers took advantage of this opportunity. In the same year, 689 employees returned to their workplaces, of which 233 were female and 466 were male. Employees are promptly informed of all significant operational changes by the company. In addition to regular and ad hoc information provided to all employees via the intranet as well as information letters from the CEO and management in all relevant languages, the company complies with all local statutory and operational requirements regarding the provision of information to employee representatives and employees. Moreover, corporate information sessions such as town hall meetings are regularly held. With regard to the zero-tolerance approach of Clariant against any form of discrimination, regional and local HR departments work toward ensuring avoidance or elimination of any discriminatory practices in work-related activities, particularly regarding remuneration, training, vocational guidance, and social security. Globally, the average basic salary of female employees was 96% of that of the average male employee in 2018. Respecting human rights is key to sound business governance and to promoting socially sustainable growth. Clariant is committed to supporting human rights, both in its own operations and in its supply chain. It expects suppliers and business partners to maintain the same high human rights standards, as this is a prerequisite for any company’s license to operate. Under the lead of Corporate Sustainability and Regulatory Affairs (CSRA), the Human Resources, Legal, and Procurement Departments have a shared responsibility for managing human rights. Clariant’s commitment to respecting human rights is enshrined in its Human Rights Policy Statement, adopted in 2015, in which Clariant reaffirms its commitment to the United Nations Human Rights Declaration and the ILO Declaration on Fundamental Principles and Rights at Work. The policy statement applies to all direct operations and activities, and articulates a clear expectation of suppliers and contractors to uphold the same standards. In addition, requirements regarding key human rights principles are included in Clariant’s Code of Conduct, the Code of Conduct for Suppliers, and the Employment Standards Guidelines, which protect workers’ rights with regard to non-discrimination, forced labor, child labor, fair working conditions, freedom of association, privacy, effective remedies, and workplace health and safety. The Code of Conduct is binding for Clariant’s direct operations, including all joint ventures that are controlled by Clariant or in which it holds a majority interest. The Code of Conduct for Suppliers extends to Clariant’s suppliers and their contractors. The rights of community members—particularly regarding environmental health and safety—are a key priority for Clariant. Thus, it protects them with a comprehensive set of binding environmental, health, and safety rules. Clariant is a signatory to the UN Global Compact. It also strongly supports collaborative initiatives that promote sustainability and respect for human rights across the industry as a member of Together for Sustainability (TfS) and the Roundtable on Sustainable Palm Oil (RSPO). In 2016, Clariant carried out a human rights due diligence assessment with the support of external human rights experts to evaluate the potential human rights impacts of its operations and activities, as well as the effectiveness of the management and monitoring systems in place. The accompanying graph illustrates the key elements of the due diligence process. Through a series of interactive working sessions, several key functions and departments prioritized activities based on their scale and relevance to the business and their probability of having adverse effects on the human rights of workers, communities, and other groups. 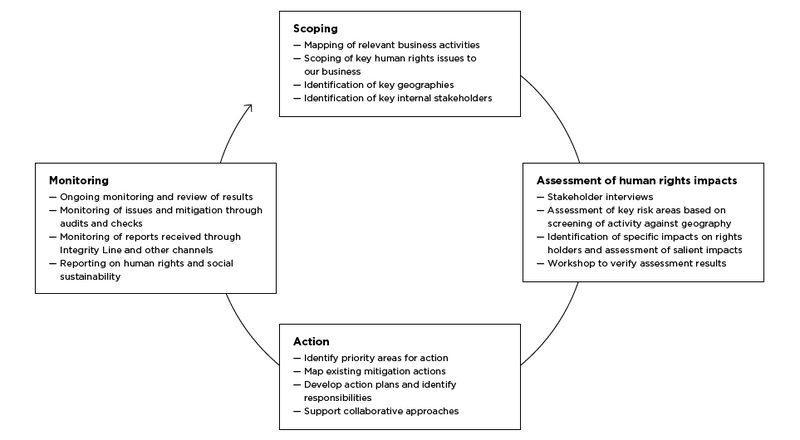 A human rights assessment was carried out for a number of priority activities, integrating both internal and external risk factors, such as complex subcontracting arrangements and vulnerabilities of specific groups, as well as aggregate human rights risk levels of countries and industries. The evaluation of environmental and social impacts, as well as labor rights in Clariant’s own operations and along its supply chain, played an important role in determining to what extent Clariant appropriately mitigates adverse human rights impacts. The assessment found that Clariant has a comprehensive set of policies, guidelines, and processes in place to ensure the implementation of its human rights commitments. In addition, it found that specific mitigation actions had been conducted for some of the high-risk areas identified in the human rights impact assessment. The assessment further concluded that Clariant’s potential human rights impacts primarily relate to contract labor and the supply chains for natural raw materials, particularly in geographies with weak national legal frameworks. Building on this assessment, in 2017, Clariant carried out a review of the legal requirements, conditions, and control measures related to contract labor in India. The review found that the country organization is well aware of the legal requirements and has implemented a clear and comprehensive process, supported by detailed evidence, checklists, and regular exchanges with authorities. Addressing and closing the identified gaps in Clariant’s mitigation framework is a priority in the coming years. Clariant focuses on securing the same requirements for contract labor that are applied by employment agencies and contractors. Regarding the supply chain, Clariant will continue to address supply chain risks based on the geographical origin of particular raw materials to gain a better understanding of potential human rights impacts, especially in high-risk countries. Clariant relies on well-established management and monitoring systems that enable the company to detect and mitigate potential human rights risks. In the future, Clariant will further align and streamline its activities and review the need for additional internal human rights training. The evaluation of the management approach includes benchmarking against Clariant’s peers, using external benchmarks such as the Dow Jones Sustainability Index, and participating in external networks, discussions, and report reviews. In 2018, Clariant was made aware of three cases, all of which have been reviewed. For one case, remediation actions were implemented. Clariant supports freedom of association. As part of this, it respects the right of employees to join unions and to be represented by representatives of these unions internally and externally in accordance with the applicable national or local laws and practices. The same standard is applicable for suppliers. As laid down in the Code of Conduct for Suppliers, they must observe the right of their employees to strike and to be members of trade unions. Clariant knows of no cases in which freedom of association or the right to collective bargaining has been seriously jeopardized or breached. Clariant is assessing its suppliers in relation to freedom of association, among other social, governance, and environmental topics, together with other companies via the Together for Sustainability (TfS) platform. For more information, please see disclosure 308-1. In 2016, Clariant also launched a human rights due diligence assessment that continued in 2018 with mitigation activities. Clariant condemns all forms of child labor and respects the rights of children. Consequently, HR ensures by appropriate processes and practices that minimum age provisions of national labor laws and regulations are adhered to, and adequate and verifiable mechanisms for age verification at Clariant workplaces are used by local HR. ILO convention numbers 138 and 182 are expressly acknowledged as the minimum standard. Clariant is not aware of cases of child labor in the company or with its suppliers. Similarly, Clariant rejects any form of forced labor or slavery and is not aware of any cases of forced labor or slavery in the company. Clariant is assessing its suppliers in relation to child and forced labor, among other social, governance, and environmental topics, together with other companies via the Together for Sustainability (TfS) platform. For more information, please see disclosure 308-1. In 2016, Clariant also launched a human rights due diligence assessment that continued in 2018 with mitigation activities. Clariant monitors and manages human rights impacts, both in its own operations and in supply chains, and works to make sure that there is no contribution, knowing or unknowing, to any adverse human rights impacts. Clariant assessed all of its operations globally in a human-rights due-diligence review. For details on Clariant’s commitments, the process, and findings, please see the Human Rights Management Approach and Clariant’s Human Rights webpage. Furthermore, Clariant established the »Clariant Integrity Line« to enable people to bring to our attention any concerns they may have. The Integrity Line is a channel through which all violations against the Code of Conduct can be reported, including discrimination or violations of human rights. E-learning modules are mandatory for all employees. Participation in these training courses, which cover different topics or themes of the Code of Conduct, is registered, and defaulters receive a warning. The code is available in all relevant national languages. All investments with a total volume of more than CHF 1 million must be approved by the Investment Subcommittee of the Executive Committee (EC). The subcommittee makes its decision based on financial, strategic, and sustainability criteria, the latter of which also includes human rights aspects. Clariant aspires to be perceived by its stakeholders as a world-class, high-performance company and a reliable partner that acts with the utmost integrity. Clariant believes that sustainable business success is closely linked to compliance with laws, regulations, and ethical standards. Clariant’s stakeholders and society at large do not tolerate bribery and corruption from a reputable and sustainable company. Applying the highest standards of diligence and compliance with all rules and regulations is thus essential for long-term business success, not only in Clariant’s own operations, but also with respect to the third parties acting on behalf of Clariant. Clariant’s Business Units are responsible for managing business ethics and compliance in their daily operations. Group Compliance and Group Legal Services provide support to the businesses to achieve adherence to Clariant’s highest ethical standards, gain trust from its stakeholders, and ensure an impeccable reputation in the market place. The Strategic Ethics & Integrity Roadmap, with its five-pillar approach, provides guidance to achieve this objective by combining a leadership program, legal and compliance risk management, training and communication, standards and controls, as well as program measurement, auditing, and monitoring. Regular reporting on the delivery of the Roadmap, as well as updates on individual measures, cases reported, and remediation taken, is provided to the Ethics and Risk Management Committee (ERMC), which was established as a Subcommittee of the Executive Committee. In 2019, Clariant will fully roll out the Strategic Ethics & Integrity Roadmap. Another central instrument to ensure ethical behavior is Clariant’s Code of Conduct, which contains ten compliance principles. They require all employees to refrain from conflicts of interest, active or passive bribery, insider trading, antitrust violations, money laundering, account fraud, disclosure of confidential information, and abuse of business assets for private interests; to prevent environmental hazards; and to abstain from discrimination and harassment. Clariant does not tolerate any violation of the Code of Conduct. All employees are required to participate in a training session (via e-learning or in person) on the Code of Conduct. All employees are encouraged to confidentially report noncompliant behavior to the Ethics & Integrity organization. An important channel through which all violations against the Code of Conduct and any workplace-related compliance issue can be reported is the »Clariant Integrity Line.« In close collaboration with the Ethics & Integrity Team, the global Human Resource Case Manager organization within Group Human Resources takes care of any substantiated concern. Besides its globally applicable Anti-Bribery and Corruption Policy and the Gift Policy, Clariant developed local policies regarding gifts, entertainment, and community engagement work. These were introduced for Japan in 2017 and Indonesia and Brazil in 2018. Clariant focuses on advancing the implementation of its policies and procedures related to bribery and corruption and ensuring adherence by third parties acting on behalf of or representing Clariant. Clariant offers regular e-learning courses on bribery and anti-corruption. In addition, it adopted various globally applicable guidelines on antitrust law and in 2010 implemented a global training policy on antitrust law, including e-learning and classroom training courses. Clariant also conducts »Leader-led Compliance Sessions,« which provide a forum to discuss ethical dilemmas that emerge in daily business practices. These sessions will be made mandatory and rolled out to all managers who have direct reports. Following the coming into force of the General Data Protection Regulation (GDPR) of the European Union, Clariant rolled out a Data Privacy Program in 2018, consisting of a policy framework and a dedicated e-learning program. Clariant designed a five-pillar strategy with a detailed three-year plan, including key performance indicators that are tracked as of 2018. These indicators will be further evaluated to continuously improve the effectiveness of Clariant’s approach. Both the Executive Committee as well as the Audit Committee were involved in the final revisions of the indicator set and formally approved the strategy. The Executive Committee is updated quarterly and the Audit Committee biannually on the progress and further measures to be taken. Clariant also has a due diligence process in place to vet distributors and agents. The process ensures that they are neither involved in any form of bribery or compliance violation nor appear on a sanction list. It further verifies that they have an appropriate compliance framework in place and otherwise have access to a relevant training program provided by Clariant. Clariant's investigation and remediation process applies to all reported concerns and breaches of the Code of Conduct. Corporate Functions (Group Compliance, Group HR, Corporate Auditing, ESHA, and other functions, where appropriate) are responsible for the investigation, and Compliance Committees (regional or Group level) are responsible for remediation. In 2018, Clariant received 104 reports, of which 71 are alleged breaches of the Code of Conduct. Of these, 37 cases were related to business integrity and 20 cases were related to treatment of employees. Among the cases not related to the Code of Conduct, 5 were related to Health & Safety or Environmental violations, 9 were "ask a question" and 5 could not be classified. The Clariant Code of Conduct will be subject to review in 2019 to reflect the change in mindset and culture. Corruption risks are investigated as part of the ongoing internal auditing of Clariant. The Ethics and Integrity Function is also performing targeted risk assessments in the Business Units with a higher risk exposure. To prevent corruption risks, Clariant conducted business reviews of high-risk businesses in high-risk environments with high-risk customers, and as of 2019, the company will explore job rotations for exposed functions. In 2018, Clariant continued anti-corruption training throughout the entire organization through both e-learning courses and classroom-based (face-to-face) courses to avoid possible violations of the Code of Conduct. Training is group-specific, based on cases, and modern training tools are used (films, comics, etc.). It is mandatory for all employees of the target group, and non-participation is reported. In 2018, Clariant initiated a specific anti-corruption e-learning module. Special target groups received further face-to-face training courses on various topics, for example, regarding competition and antitrust law. In 2018, this training was administered to many employees in all regions. New employees were also familiarized with our Code of Conduct and ABC Policy. An awareness campaign was also launched to demonstrate the appropriate attitude and tone regarding anti-corruption from the top of the company. In 2018, there were nine allegations regarding bribery, corruption, and kickbacks brought forward. They led to disciplinary actions against 15 employees. In six cases, the responsible employee was dismissed. There were no legal proceedings against Clariant or its employees for alleged corruption. In addition, Clariant terminated relationships with six business partners (agent, distributor, or consultant). In 2018, Clariant was still subject to an ongoing competition law investigation by the European Commission into the ethylene purchasing market, which had started in 2017. The company is assisting the relevant authorities and cannot comment further on the details of the ongoing investigation. In 2018, there were no further reported legal actions for anti-competitive behavior or antitrust or monopolistic practices. Clariant reports significant legal actions in its Integrated Report. Clariant was not aware of any cases in the year under review in which the company was accused of not having acted in compliance with laws, regulations, and voluntary codes of practice. Consequently, no significant fines or non-monetary penalties for failure to comply with legal regulations were levied. Clariant proactively manages climate change-related risks, such as physical, regulatory, and reputational risks, to achieve cost reductions through the optimization of operational efficiency and to remain competitive with regard to energy and material costs. In addition, in light of increasing demand for climate-friendly products, Clariant’s climate strategy includes developing innovative solutions for particular markets. These solutions help maintain or increase Clariant’s customer base and enhance the company’s reputation. Climate change is relevant for Clariant’s own operations, its supply chains, and the entire life cycle of its products. Ultimately, if global warming cannot be stopped at a safe level, society at large and thus Clariant’s business will be seriously impaired. Responsibility for ensuring the management of climate change lies within Corporate Sustainability & Regulatory Affairs (CSRA), whose Head reports directly to the Executive Committee. CSRA works closely with other relevant corporate functions, such as Group Technology & Innovation and Group Procurement Services, as well as Business Units that are developing low-carbon and climate-friendly solutions to respond to societal challenges and customer needs. To reduce its climate impacts, Clariant is pursuing its 2025 environmental targets. Compared to 2013, the company is aiming to reduce energy consumption and direct CO2 emissions by 30% and emissions from greenhouse gases by 35%. These reduction targets are an integral part of Clariant’s planning and investment strategy. Beyond Clariant’s commitment to emission reductions, the company is running successful initiatives related to energy management, such as the Clariant Production System’s Yield, Energy, Environment (YEE) initiative and eWatch, an energy efficiency program that identifies savings potential through detailed analysis of energy consumption across operations. Finally, Clariant actively contributes to the fight against climate change through its innovative and sustainable product offerings across all four business areas. Clariant’s Portfolio Value Program (PVP), a key initiative to make sustainability integral to the product portfolio, also features climate change-related criteria, such as raw material sourcing, material efficiency, energy consumption, and associated emissions. Clariant’s EcoTain® label takes current and future societal trends into account by identifying products that provide best-in-class solutions to address challenges presented by sustainability topics such as climate change. To evaluate the effectiveness of its management approach, Clariant monitors the development of its climate impacts by collecting environmental key figures on energy consumption and direct and indirect greenhouse gas emissions across Business Units, thereby measuring the trajectory toward achieving the 2025 targets. Clariant is well on track to meet these ambitious objectives. In view of growing expectations of external stakeholders, Clariant verified and reported its Scope 3 emissions for the first time, in order to strengthen the development of a holistic climate strategy. The strategy will include measuring potential impacts of climate-specific risks, deploying additional mitigation measures, further reducing emissions in operations, analyzing cleaner energy alternatives, and fostering collaboration opportunities in the value chain. Every three years, Clariant validates the production volume from all production sites. The last full reporting campaign was in 2017. In interim years, including 2018, the reduced reporting scope comprises the larger sites responsible for 95% of production. The direct greenhouse gas emissions, which result largely from the carbon dioxide emissions (CO2) of the combustion processes operated by Clariant, are directly proportional to the amount of carbon in the fuels used. Emissions of other greenhouse gases like methane and nitrous oxide (N2O) are measured locally and integrated into the consolidated calculation of greenhouse gas emissions. Indirect greenhouse gas emissions result from external energy procurement, predominantly in the form of electricity and steam. Indirect greenhouse gas emissions are predominantly generated by external energy procurement, usually in the form of electricity and steam, and thereby almost exclusively CO2. Their emergence correlates closely with the amount produced and are less influenced by Clariant than direct emissions. To calculate Scope 1 emissions, stoichiometric emission factors of the respective primary fuels are used. For Scope 2 emissions, either specific emission factors from the local providers are used, or country grid factors, which are published by the GHG Protocol. Also, for internal and ISO 50001 reporting, the eWATCH team calculates site-specific conversion factors for energies and utilities used on-site, which is done in close interaction with the energy managers from the sites. Calculated conversion factors help benchmark the CO2-intensity of different energies and utilities and can point to potential operational improvements. The amount of all greenhouse gases (expressed in CO2 equivalents) decreased from 0.97 million t to 0.93 million t, mainly due to the reduced production volume in 2018 (-5.5%), which also increased the emission intensity from 211 to 215 kg per manufactured ton of production. As part of its reporting for the Dow Jones Sustainability Index (DJSI) and the Carbon Disclosure Project (CDP), Clariant has reported Scope 3 emissions for its most relevant activities: purchased goods, fuel- and energy-related activities (not included in Scope 1 or 2), upstream and downstream transportation and distribution, and end-of-life treatment of sold products. The calculation method is in line with the »Guidance for Accounting & Reporting Corporate GHG Emissions in the Chemical Sector Value Chain« from the World Business Council for Sustainable Development (WBCSD) and the GHG Protocol. In 2018, more than 180 projects delivered energy and CO2-reduction benefits, mostly within Clariant’s eWatch program and Yield, Energy, Environment (YEE) initiative. Through eWATCH, Clariant crafted a comprehensive energy-efficiency program that analyzes energy consumption across operations and identifies potential cost-saving opportunities. Since 2013, a total of CHF 26.7 million was saved by implementing energy-efficiency measures and energy-purchasing optimizations. In 2018, Clariant managed to save CHF 3.85 million. The Production System YEE initiative analyzes Clariant’s production processes and units to discover even more opportunities to increase yields, improve energy efficiency, and reduce waste streams. Since its inception in 2012, Clariant achieved savings with the YEE of more than CHF 50 million. In 2018 alone, savings amounted to CHF 6 million. Ozone-depleting substances are no longer used by Clariant. Cooling agents, if relevant, are now reported under greenhouse gases. To calculate emissions, standard emission factors are used, which are based on stoichiometry and common waste gas treatment techniques. Where possible, more specific local factors are used. An open, transparent, and trustworthy dialog with all stakeholders is essential for Clariant. Building networks and relationships within the chemical industry, as well as with policymakers and other stakeholders such as non-governmental organizations (NGOs), helps Clariant anticipate and mitigate risks driven by regulatory or stakeholder pressure, identify business opportunities, and create competitive advantages. Clariant believes that participating in policy dialog is an important element of corporate responsibility. Thus, in line with the company’s strategy and business objectives, Clariant contributes to policy development in relevant areas such as chemical management and substitution, climate change, energy, bio-economy, circular economy, competitiveness, trade, and innovation. The topic is not only relevant for Clariant’s operations and value chains, but also impacts its public outreach, for example, via trade associations, to position the company and the chemical industry on strategic policy areas. The overall responsibility for policy and stakeholder relations is assigned to Corporate Sustainability & Regulatory Affairs (CSRA). At the local level and within certain sectors, the Business Units and regional organizations have a responsibility to maintain and engage in the policy dialog, as they are well-positioned to understand and address the local and sector-specific challenges and stakeholder networks. Clariant follows several avenues to contribute to public policy development. It periodically publishes position papers and responds to public stakeholder consultations and surveys. Clariant also anticipates and goes beyond regulatory requirements to abide by its ambitious sustainability commitments, and promotes policy development and stakeholder relations accordingly. The engagement of Clariant representatives in trade associations and other platforms supports strategic alignment across the industry, provides an opportunity for exchange on industry perspectives and best practices, and brings forward Clariant’s views and interests. Clariant has implemented clear policies for engaging in public policy development, addressing the increasing attention stakeholders and the public pay to such activities. Clariant’s Anti-Bribery and Corruption Policy establishes detailed rules for employees’ interactions with public officials and political advisors, as well as for charitable contributions and political donations, and forbids any donations to political parties and related organizations. Clariant openly discloses information about its fields of interest and the scope of public affairs activities, for example, in the »Transparency Register« of the European Commission. Other activities include active participation in associations, such as the European Chemical Industry Council (Cefic), national chemical associations, and sectorial business associations, and ad hoc collaborations with NGOs. Specific advocacy activities were implemented on regulatory dossiers, for example, in the context of the revision of the EU Renewable Energy Directive. Clariant actively supported an ambitious blending target for second-generation biofuels. Clariant’s advocacy activities are strongly linked to the company’s growth and sustainability strategy. In the context of its advocacy strategy, which is currently under review, Clariant aims to further strengthen these ties by paying closer attention to topics such as bio-economy, circular economy, and chemical substitution. Clariant supports the call for increased transparency regarding lobbying activities and political contributions. Through its reporting on the Carbon Disclosure Project (CDP) and the Dow Jones Sustainability Index (DJSI), Clariant discloses the issues it has discussed with policymakers and trade associations that are likely to take a position on sustainability topics such as climate change. Moreover, Clariant performs an annual review of its membership costs and publicly discloses its top membership contributions, as well as the budget allocated to policy memberships. Clariant’s continuous dialog with policymakers, NGOs, and forward-looking industry associations further supports evaluating the effectiveness of its public policy management approach. The Clariant Corporate Citizenship Management Policy and the Anti-Bribery and Corruption Policy explicitly exclude donations to political parties. Accordingly, Clariant did not render any donations to parties, politicians, or related organizations in 2018. Clariant believes that true leadership in sustainability extends beyond the company and its own operations, taking into account sustainability impacts and leveraging sustainability opportunities across the entire value chain and in broader society. Customers, employees, community members, and other stakeholders, including the public, expect companies to understand their wider impact and drive sustainable change and growth. Clariant’s sustainability strategy thus also includes its comprehensive and complex supply chains, and all of its suppliers. In order to be a true sustainability leader, it is imperative for Clariant to go beyond its own operations and drive its sustainability strategy across the entire spend on materials and services. Thus, sustainability criteria play a central role in assessing Clariant’s performance in supply chain management. As part of Clariant’s full commitment to identifying and continuously reducing potential risks and, therefore, enhancing the sustainability performance across its entire end-to-end supply chains, Clariant proactively engages with suppliers to monitor and improve the sustainability performance of materials and services it sources from them. Clariant Procurement has developed and rolled out the sustainability strategy across all regions and spend categories, covering more than CHF 4 billion of yearly spend. Sustainability is an integral part of Clariant’s procurement practices – irrespective of material, geography, or risk potential. Suppliers, outsourcing partners, and service providers are selected and managed based on a comprehensive set of criteria. These benchmarks include not only economic and product-specific performance, but also non-financial and sustainability considerations, such as complaint management, creditworthiness, safety standards, working conditions, and respect for human rights. The policy cornerstone of Clariant’s sustainable procurement approach, the Supplier Code of Conduct, is based on the UN Global Compact and Responsible Care® principles. It was rolled out in 2014 across the entire supply base of more than 22,000 suppliers through written communication and via face-to-face meetings with top suppliers in each region. It is also incorporated in the General Terms and Conditions of Purchase incorporated in every purchase order issued by the procurement organizations. Clariant expects its suppliers to abide by this Supplier Code of Conduct and to make every effort to keep the environmental impact and negative social effects arising from business activities at a minimum. If the Code of Conduct is not embraced by business partners, Clariant retains the right to end business relationships. Since 2013, Clariant annually develops a Procurement Sustainability Roadmap based on insights, learnings, and feedback gathered in previous years. The roadmap defines focus areas, strategies, and indicators, and is deployed across the entire organization and spend. Roadmap development and delivery processes are coordinated and steered by the Group Procurement Service’s Strategy Initiatives and Sustainability Team, which directly reports to Clariant’s Chief Procurement Officer. Each employee working at Clariant Procurement has assigned targets that are tracked and evaluated at the monthly Procurement Management Committee meetings. To build and continuously update skills in supplier sustainability management and to ensure sustainability is a critical part of the state-of-the-art procurement expertise, Clariant Procurement develops and deploys a Sustainability Capability-Building Program with yearly waves of training sessions and support materials. By joining the »Together for Sustainability (TfS)« initiative, Clariant has taken supplier sustainability monitoring and improvement to a best-in-class level. The TfS supplier sustainability evaluation covers both materials and services, and is based on standard state-of-the-art methodologies and an approach jointly developed by the procurement leadership and organizations of multinationals of the chemical industry. It is managed through leading external global service providers specialized in sustainability selected and managed by TfS: EcoVadis for online assessments; DSQ Group, ERM, Intertek, and SGS for on-site audits. The approach developed and implemented by TfS leverages synergies among the participants and delivers an independent, standardized, and quantitative evaluation of suppliers’ sustainability performance and risk profiles. The outsourcing to third-party service providers guarantees process robustness, independence, confidentiality, and conformity with antitrust and competition law. Clariant prioritizes the assessment and audit of suppliers according to country and business risks, global category priorities, and purchase volumes – across its entire spend. Through TfS, Clariant has online access to a large number of assessment scorecards and audit reports generated by the external service providers on behalf of all the TfS members. Regarding the assessments, in addition to an overall score, the scorecards also contain an individual score for the critical dimensions of environment, labor practices, fair business practices, and sustainable procurement. Further, and most importantly, assessment scorecards and audit reports provide detailed feedback on specific improvement areas and guidance on where and how to address the identified gaps. This comprehensive approach and outcome provide Clariant with the basis to engage with its suppliers and agree on ad hoc corrective action plans and, therefore, mitigate sustainability risks and improve sustainability performance in its supply chain. This allows Clariant to monitor, measure, and improve supplier sustainability performance and identify improvement opportunities against principles laid out in the Supplier Code of Conduct, and embed sustainability as integral part of supplier selection and management. Clariant’s yearly Procurement Sustainability Roadmap is also based on insights and feedback gathered through external evaluations such as the DJSI RobecoSAM Company Sustainability Benchmark Report and EcoVadis Scorecard, as well as industry benchmarks with best-in-class companies within and outside of the chemical industry, and conference participation. Thus, breadth and depth of the roadmap are continuously enhanced. In addition to the Dow Jones Sustainability Index World and Europe listing since 2014, Clariant Supply Chain Management was nominated as one of the top ten best supply chain organizations in sustainability across 60 industries by RobecoSAM. Clariant received the highest EcoVadis score of the global chemical industry for the second time in a row. In 2018, Clariant again went through the EcoVadis assessment obtaining a score of 80, a very prestigious milestone that no other peer company in the chemical industry has reached yet. In particular, the score of 80 in Sustainable Procurement places Clariant in the 99.7 percentile, meaning only three companies among 1 000 across any industry reach a better score. Furthermore, in December 2017, Clariant received the prestigious EIPM Award for sustainability leadership in supply chain. Clariant’s Procurement preferentially sources goods and services from within the region in which its respective operations and manufacturing plants are located, as far as qualitatively compatible, technically feasible, and economically viable. This way, Clariant’s activities support the economic development of the regions in which it operates. This is particularly relevant for and encouraged in key emerging markets such as Brazil, China, and India. Clariant defines local suppliers as suppliers that are based in the same country or region where the materials and/or services are used. Clariant selects and manages its suppliers, outsourcing partners, and service providers based on a comprehensive set of criteria. The selection of suppliers is not only based on economic and product-specific performance aspects, but non-financial and sustainability considerations are explicitly taken into account as well. Clariant’s sustainability standards are incorporated into its procurement strategies and activities, policies, and general guidelines (such as the Code of Conduct for Suppliers). By joining the »Together for Sustainability« (TfS) initiative, Clariant has taken the sustainability monitoring and improvement of its suppliers to a new, best-in-class level. In fact, the TfS evaluation of suppliers – both with regard to materials and services – is based on a state-of-the-art methodology and approach jointly developed by the procurement leadership of six multinational chemical companies. It is managed through leading external global service providers specialized in sustainability, such as EcoVadis for online assessments and DSQ Group, ERM, Intertek, and SGS for on-site audits. Through TfS, more than 10 000 (2017: 8 600) supplier assessment scorecards and more than 1 500 (2017: 1 100) supplier audit reports have been generated, and are shared among all TfS Members via an online platform. This serves as a basis to drive improvements in sustainability performance across the respective supply chains. In 2018 alone, 358 new TfS supplier audits were conducted, and 1 491 new supplier assessments were generated. By mapping supplier sustainability scorecards against Clariant’s supply base, Clariant reached more than 74% (2017: 65%) of its yearly CHF 2.9 billion (2017: 2.7 billion) direct spend covered with a sustainability evaluation of suppliers. These numbers are based on mapping the suppliers from the EcoVadis platform to Clariant's own spend database. In 2017, Clariant began a program of Corrective Action Plans (CAPs) in order to reduce supplier sustainability risks. In 2018, 20% of the 955 suppliers identified as having significant actual and potential negative environmental impacts have been taken through the CAP program. For information regarding 414-1, please see disclosure 308-1: New suppliers that were screened using environmental criteria. These numbers are based on the mapping of the suppliers from the EcoVadis platform to Clariant's own database. In 2017, Clariant began a program of Corrective Action Plans (CAPs) in order to reduce supplier sustainability risks. In 2018, 26% of the 1 205 suppliers identified as having significant actual and potential negative social impacts have been taken through the CAP program. For more information regarding 414-2, please see disclosure 308-1: New suppliers that were screened using environmental criteria. The GRI Report is also available as PDF. The Clariant Integrated Report 2018 provides an overview of how Clariant creates value in multiple dimensions.